We are pleased to announce a successful exit from Shades of Light through a recapitalization. In 2011, Merion purchased the company in partnership with an independent sponsor. 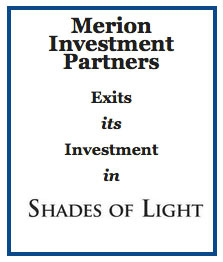 During Merion’s investment, the company successfully de-levered by doubling sales and tripling EBITDA. Shades of Light is a designer and retailer, through catalog & e-commerce, of lighting and other home furnishings sold to individuals and interior design companies. DataBank IMX, LLC (DataBank) announced today that it has acquired Advanced Data Systems (ADS), headquartered in Tallahassee, FL with offices in Jacksonville, Orlando and Miami.